It had previously been thought that planets were more likely to form around a star if the star had a high content of heavier elements. But new research from the University of Copenhagen, among others, shows that small planets can form around very different types of stars – also stars that are relatively poor in heavy elements. This significantly increases the likelihood that Earth-like planets are widespread in the universe. The results have been published in the prestigious scientific journal, Nature. 3,000 exoplanets, i.e. planets orbiting a star other than the Sun, have now been discovered. 2,300 of these potential planets are being observed with the Kepler Satellite by measuring the brightness of the host stars. If a planet moves in front of its star, there is a small decrease in the brightness and if this happens repeatedly, it could be a planet orbiting the star and dimming its light. A multitude of planets have been discovered so far and by measuring their size it is possible to distinguish between gas giants like Saturn and Jupiter, or whether they are smaller, terrestrial planets like Earth and Mars. But it is not only the planets that are interesting. It is also the stars that they are orbiting. Because what are the requirements for planet formation? 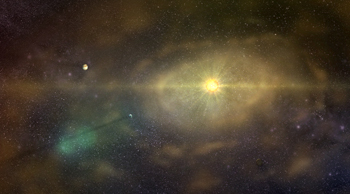 “I wanted to investigate whether planets only form around certain types of stars and whether there is a correlation between the size of the planets and the type of host star it is orbiting,” explains Lars A. Buchhave, astrophysicist at the Niels Bohr Institute and Centre for Star and Planet formation at the University of Copenhagen. Lars A. Buchhave therefore developed a method to ‘wring’ more information from the stellar spectra. Up until now, we have seen that most of the gas giants were associated with stars with a high content of heavy elements. For a star to have a high content of heavy elements it has to have gone through a series of rebirths. A star is a large ball of glowing gas that produces energy by fusing hydrogen and helium into heavier and heavier elements. When the entire core has been converted into iron, no more energy can be extracted and the star dies flinging massive clouds of dust and gas out into space. These large clouds of gas and dust condense and are recycled into new stars and planets in a gigantic cosmic cycle. The new stars that are formed will have a higher content of heavier elements than the previous and for each generation of star formation there are more and more of the heavy elements and metals. The planets are formed from the remnants of the clouds of gas and dust that rotate in disc around the newly formed star. In this protoplanetary disc, the elements begin to accumulate and clump together and slowly the planets are formed. In the later generations of stars with a high content of heavy elements, the rotating disc of dust and gas particles has an elemental composition that is most likely to promote the formation of gas giants like Saturn and Jupiter. Recent research shows a different picture for the smaller planets. “We have analysed the spectroscopic elemental composition of the stars for 226 exoplanets. Most of the planets are small, ranging from planets corresponding to the solid planets in our solar system, up to planets four times the radius of the Earth. What we have discovered is that, unlike the gas giants, the occurrence of smaller planets is not strongly dependent on stars with a high content of heavy elements. Planets that are up to four times the size of Earth can form around very different stars – also stars that are poorer in heavy elements,” Lars A. Buchhave. The conclusion, says Lars A. Buchhave, is that these observations mean that Earth-like planets could be widespread throughout our galaxy, as they have no special requirements for an elevated content of heavy elements in stars in order to be formed. This conclusion resonates well with the picture that is emerging of the distribution of small planets in our galaxy, namely that it seems more the rule than the exception that a star has small planets orbiting them. Because small Earth-like planets are not dependent upon a high content of heavy elements in their host star, they could be both widespread and could have been formed earlier in our galaxy.